After a week of running around, lots of driving and socializing, I treated myself to just an hour by myself on the Ft. Lauderdale beach… and everything slowed down nicely. As I was watching the waves, I decided to try out the slow-motion video function on my new iPhone. 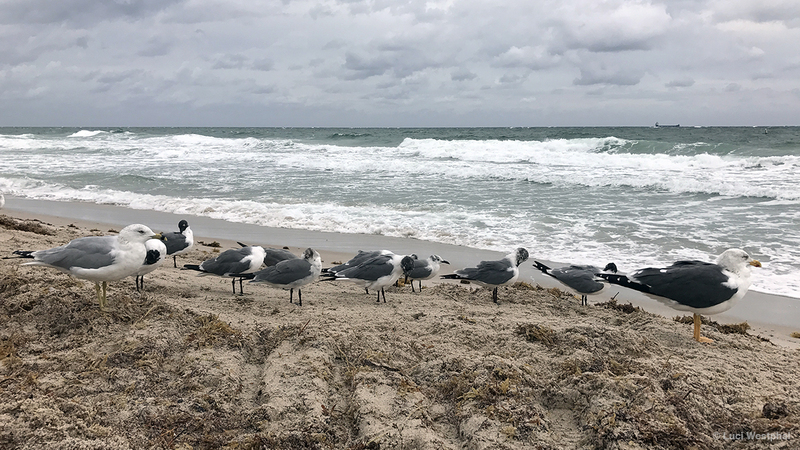 The next morning, a storm rolled in, and I returned to the beach to capture seagulls appearing to fly backwards as the wind pushed them up the shore. I had come down to Ft. Lauderdale from St. Augustine on a short road trip with my cousin Annick from France and her family. Along the way, we also visited Daytona Beach, the Kennedy Space Center, Cocoa Beach and West Palm Beach. There’ll be a video from one of these locations next week… but I won’t tell you which one yet. In Ft. Lauderdale, we stayed at the stylish mid-century retro Aqua Hotel, which I would highly recommend. I also recommend taking in the crashing waves on the beach at night. But the best part of my short trip to Ft. Lauderdale Beach was hanging with my friend April Ruane Crowley at Elbo Bar, the oldest bar on Ft. Lauderdale Beach. Just talking, drinking beer and watching live music with the beach right outside… talk about a Happier Place! A technical note: I am very impressed with the video capabilities of the iPhone 7. While this slow motion footage, can only be shot in 1080p at 120fps, at 720p it also shoots at 240fps. And I think it looks pretty damn amazing. More importantly though to me is that for a camera that you most often use for filming without a tripod, the internal image stabilization is quite astonishing. I didn’t do any other stabilization in post-production. And it was stormy as I filmed about half of this footage. Last but not least, footage at 30fps can be shot in 4k. I love my new camera… which also allows me to make phone calls, send Bitmojis and play Candy Crush! The music in this video is the song “Autumn” by Josh Woodward. This song is licensed under a Creative Commons Attribution 4.0 US License. I’ll be posting photos from Ft. Lauderdale throughout this week to the In Another Minute 2017 Flickr album, on Google+ and Facebook, and there will probably be a dedicated photo post on my blog.